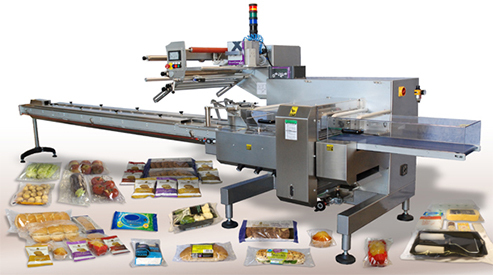 Tisomi is a UK specialist supplier of flexible flow wrap machines for food and non-food items. Tisomi’s flow wrappers can safely wrap a whole range of different shaped products in any configuration, while at the same time prolonging shelf life and maximising visibility on retailers’ shelves. Call today on +44 (0)1937 858204 or click to contact us. Operating nationally and servicing the whole of the UK and Ireland, Tisomi offers a range of top-quality, Italian manufactured automatic flow wrap machines for food such as bakery, fresh produce, ready meals and confectionery, as well as the housewares and novelties sectors. All of Tisomi’s flow wrap machinery are highly-versatile packaging solutions which can improve productivity, enhance a products’ pack presentation and performance to market and protect the integrity of goods. Installing a Tisomi flow wrap can, literally, transform a business. Tisomi’s flow packers and flow wrap machines can also be customised to meet each customer’s specific requirements, allowing the best possible production speed and flexibility, leading to greater efficiency and lower output costs. Every Tisomi model is offered with a range of optional flow wrap solutions for the packaging of food and non-food items. The business prides itself on providing quick turnaround, high performance, rugged construction and reliable flow wrappers. These key requirements, coupled with superior levels of technical back-up and investment in research and development makes Tisomi the first choice for a large number of household names. Tisomi offers comprehensive flow wrap product trials to ensure accurate alignment, a secure seal and the best possible product presentation, to support the customer’s needs from start to finish. The company also offers a strong after sales service technical support including the initial installation of the flow wrap machine in the event of any potential teething issues. With many decades of experience Tisomi offers a prompt, personal service in ascertaining the best solution for a business’s packaging requirements. This success, has been developed around offering customers a very personal service which in summary has been built around flow wrap product trials, installation and a great after sales service. If you want a no nonsense, honest approach to flow wrap and flow packing, please talk to Tisomi today. 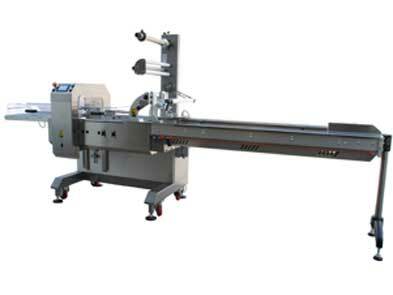 Quality is the watchword at Tisomi Packaging Machinery as we combine European manufactured flow wrappers with exceptional technical support. The range of packaging equipment we supply is designed to last and offers high performance for the food, household and novelty sectors. With a range of options including labellers, date and time coders, collators and conveyors, Tisomi can provide fully integrated flow wrapping solutions and excellent customer and parts services from its UK facility in Wetherby, West Yorkshire. The company offers a complete package to meet the exacting flow wrapping needs of its customers, from large multi-nationals to small independent businesses. Specify what you want and our experienced engineers will explain what flow wrapper is needed for the job, the interesting bit on what the equipment does, how much it will cost and our after-sales service plan – you can’t be clearer than that! Whether it’s wrapping food, housewares or novelty products, we will tell you how Tisomi’s flexible and expertly engineered flow wrapping technology can meet the most exacting needs and the price of that expertise – with no hidden extras! Look at the testimonials from the many happy Tisomi customers who say the equipment and service provided have exceeded their expectations. Tisomi Packaging Machinery is one of the most trusted flow wrapping specialists in the UK – we will go the extra mile on the customer’s packaging journey. We supply a comprehensive service from start to finish, including pre-purchase trials at our Wetherby facility to ensure the customer’s packaging requirements are being met. Whether seeking customised flow wrapping equipment for a production line or a stand-alone machine, you can trust Tisomi to deliver the right solution. I rate Tisomi very highly. They delivered excellent customer service – their knowledgeable and experience also made commissioning a pleasure. We would definitely use Tisomi again.